The QHS Class of 1984 will be holding its 35th Reunion on September 20th and 21st, 2019. Friday the 20th will be at Flinn Stadium during the football game and Saturday the 21st will be at the Dock from 6pm till closing. All 1984 alumni are highly encouraged to send their contact information (to include e-mail address) to QHSclassof84reunion@comcast.net. Also see the facebook group QHS Class of ’84’ Reunion for most current information. Quincy, Illinois – The Quincy Public Schools Foundation ended its 2018 Dream Big Annual Campaign on a high note, exceeding the $150,000 goal by over $60,000, with a final total of $212,750. Proceeds from this year’s campaign will be allocated to the five “pillars” of the Foundation: Curriculum, Technology, Fine Arts, Athletics, and Endowment; special projects, as well as professional development and training for teachers. A portion of proceeds will also benefit operations of the Foundation and help to establish a special endowment for operations. “We predict that a consistent, annual campaign from the Foundation is going to be critical to meeting district needs and maintaining quality in the district,” Embree added. The major fundraising event of the campaign, the Foundation’s “A Night to Dream Big” gala dinner, had a record 600+ attendees and raised a record $93,000 for the Foundation and the Quincy Public Schools. Over the last two years, the QPS Foundation has provided over $860,000 to supplement the district’s budget and over $2.8 million, since the first “A Night to Dream Big” fundraiser in 2013. The QPS Foundation encourages donations for its endowed funds called “Circles of Investment” for specific designations across the district. A minimum of $10,000 is required to found a “Circle”, however contributions may be made to support existing Circles as well. Gifts to the QPS Foundation may be made through the Foundation office at Quincy Senior High School, through the mail, or through the foundation’s web site, www.qpsfoundation.org. Quincy, IL, February 27, 2018– On Monday, March 19th at 10:00 a.m. at the Harrison Site located at 4100 Harrison, Quincy Public Schools will mark the start of construction on their 5th new K-5 Elementary School. This celebrates the final phase of the construction of five new elementary schools following the overwhelming passing of the Quincy Schools Bond Referendum in November of 2014. Work began on the first K-5 Elementary at the Monroe Site in December of 2015; the school was opened as K-3 in August of 2017 as Lincoln-Douglas Elementary. In March of 2017 work began at Rooney Elementary (4900 Columbus Rd.) and Iles Elementary (3111 N. 12th St.); they will open their doors as K-5 elementary schools in the fall of 2018. Work continues at Baldwin Elementary (3000 Maine St.), which will close to students following the 2017-2018 school year and re-open in the fall of 2019 as a K-5 Elementary. Slated completion for the Harrison Site is also Fall 2019. Maas Construction was awarded the bid for the Harrison Site. If you would like to attend the groundbreaking, the school district asks that you park on Harrison or one of the side streets to be mindful of other residents and property owners. If you would like more information, please contact Raquel Piazza at (217) 228-7158 ext. 2224 or email at piazzara@qps.org. What started as a fun assignment for 30 Adams School third-graders last year has blossomed into a powerful educational tool that may impact local preschoolers for years to come. The assignment involved the creation of a children’s book designed to help youngsters learn how to read and recite their ABCs. Under the supervision of Sarah Guilford, the school’s music teacher, the students wrote, illustrated, colored and self-published a book based on a popular folk song about a dog named Bingo. Each verse crafted by students requires the reader to sing and spell the names of 26 animals, each beginning with a different letter of the alphabet. Guilford believed it was important to incorporate music into the book, because research shows music can be an effective learning aid for young children. The book was completed, and 50 copies were printed and distributed to disadvantaged preschoolers in Quincy. However, that wasn’t the end of the story. Some people liked the book so much that they decided it should have an even wider audience. That’s when the Quincy Medical Group’s Health Care Foundation agreed to pay to have 500 copies of the book professionally published. Starting next week, family practitioners and pediatricians associated with QMG will start distributing a copy of the book to every mother who brings in a child for a 2-year-old wellness checkup. The goal is to encourage those parents to read to their children on a regular basis. Once the 500 copies run out, more will be printed, according to Dr. Tanya Mero, an obstetrician/gynecologist who led the effort to have the book published. Mero knew about the Bingo book because her daughter, Lexi, was a third-grader at Adams School last year and served as project manager. Mero, a member of the QMG Health Care Foundation’s governing board, attended meetings with pediatricians and family practitioners to ask if they would be interested in distributing the books to the parents of 2-year-olds. Guilford initially conceived the book project after she heard about the “Ready, Set, Grow” initiative being launched in Adams County through the cooperative efforts of several community organizations. This educational initiative — sponsored by the United Way and the Regional Office of Education — strives to get preschool-age children better prepared to enter school by encouraging adults to read and talk to them from the earliest points in their lives. This effort was driven by statistics that showed 78 percent of the 3-year-olds entering Quincy’s Early Childhood and Family Center in 2012 did not recognize any letters, and 80 percent didn’t recognize any numbers. What’s more, many of those children came from homes with few, if any, books. Guilford felt Adams School students could help by collecting hundreds of used children’s books and passing them along to low-income families, but she also wanted students to use their creativity to develop a new children’s book that could serve as fun learning tool for preschoolers. That’s how the Bingo book came about. As part of the book’s publication celebration, the Regional Office of Education paid to have some hard-cover copies donated to all local libraries in Adams County. Paperback copies also were presented Friday to all 30 students who played a role in creating the book — most of them now fourth-graders at Baldwin Intermediate School. Adams School third-graders also are hoping to collect 1,000 gently used books geared for preschoolers during April. The books, in turn, will be cleaned and turned over to the Adams County Health Department for distribution to families with preschoolers. Head Start programs around the country are celebrating Head Starts 50th anniversary. This is a national program that was apart of president Johnson’s war on poverty and gives every vulnerable child an opportunity to succeed. The national Association for the advancement of young child celebrates this week each year to honor those who work within the profession. This also marks the 50th year that Quincy Public schools has had the program. Those at the early childhood education center kicked of their celebration by having students and staff dress up in different themes each day. Today the children and staff came dressed up as different characters from the movie “Frozen”. Doing this incorporates the students into the celebration and makes them apart of the week. Other themes this week has included: Sports day, pajama day and rockstar/popstar day. Next week they will be celebrating the 50 years as a program prior to the board meeting. All past staff is invited to come in for the reception that will take you down memory lane with a display of pictures, and memorabilia. Several members that started with the program in 1965 will be there. Talk about the future of the early childhood program will also be had. QUINCY, Ill. (WGEM) – Students at Monroe Elementary in Quincy serenaded Mrs. Emily Pool when we surprised her with a WGEM Golden Apple Award this week. The third grade teacher was speechless as the school sang a song about how much they appreciate her. It was clear to see how Mrs. Pool is making a big impact on her 21 students and colleagues. Her hard work, passion and dedication make her this month’s WGEM Golden Apple recipient. In the classroom, you won’t see textbooks on the desks for Mrs. Pool’s math lesson. Her third graders use white dry erase boards every day. It’s just one technique the third grade teacher uses to keep her kids engaged in the classroom and to make the sometimes tough subject more fun. Mrs. Pool has been teaching in Quincy for 10 years. After nine years at Baldwin South, Pool made the move to teach third grade at Monroe. And in just her first year at the elementary school, her co-workers say she’s made a big impact on her students. Donna Boster is the paraprofessional at Monroe Elementary in Mrs. Pool’s class. But our Golden Apple isn’t the first she’s been given. One of her past students had already given her a smaller version, because he felt she was so deserving. Now, she has two. And while she says she’s honored to be recognized, being in the classroom every day with her students and leaving a lasting impression on her kids is what she loves most about her job. You can nominate a teacher you feel is deserving by filling out the nomination form. We honor a Tri-States teacher every month. Supporters of the Quincy School District’s $89 million bond issue were able to start their victory celebration early Tuesday night — even before the final votes were tallied at the county clerk’s office in the Adams County Courthouse. This is because the supporters got some early insight into how enormously successful the vote was turning out — thanks to some extra legwork, good organization and a provision in the Illinois election code. The election law spells out several things election judges must do after shutting down polling places where optical scan ballot-counting machines are used. According to Adams County Clerk Georgia Volm, once the polls close at 7 p.m., election officials must use the optical scanners to print out several “results tapes,” which resemble long cash-register receipts. The tapes show the vote count for every race and ballot issue logged that day by the scanners, which read ballots fed into them by voters from multiple precincts. “Those results tapes are kind of important,” Volm said. One tape, for example, must be brought back to the courthouse with the optical scanner so county officials can ensure the numbers reported on the tape match the machine’s memory card, which is used to help tally the election results that get reported on the county’s website. On top of that, Volm said, the election judges are required to attach a copy of the tape to the polling place’s door as they walk out. Knowing this, the school supporters stationed volunteers outside every polling place where Quincy School District votes were cast on Tuesday — approximately 13 in all. Once the results tapes were posted for all the world to see, the volunteers made note of the yes and no votes for the Quincy bond issue. Then they telephoned the results to Brandy Blickhan, who was waiting at a computer in the Town & Country Inn and Suites ballroom, where supporters were gathering for a post-election party. Blickhan entered the results into a spreadsheet, thereby producing a running total that was frequently updated. Blickhan said the first results were called in at 7:05 p.m. — just five minutes after the polling places closed and well before election judges began arriving at the courthouse with the “official” votes in hand. Armed with their unofficial data, the school supporters were able to announce just after 8 p.m. that the referendum was passing by a margin of 66 percent to 34 percent and that it had passed in every precinct. Those preliminary results, however, did not take into account the 2,766 “early votes” still to be reported by the county clerk’s office. With those numbers added in, the clerk’s office released the final results at 8:47 p.m. showing the bond issue passed 11,001 (66.2 percent) to 5,620 (33.8 percent). Volm said results tapes have been posted on polling place doors ever since she introduced optical scanners into Adams County’s elections nearly 12 years ago. She said the organized reporting of votes by groups “hasn’t been a super-widespread practice” over the years. Years ago — before the onset of optical scans — election enthusiasts would gather at the courthouse on election night and simply wait for results to be posted on a wall for all to see. Now those folks just stay home and get the results online. John Frankenhoff, the county’s information technology guru, said he couldn’t provide any statistics on how many hits the county’s website got on election night, but he knows it’s a lot. But not as quick as some folks. Quincy native John Lynn Lubker developed a love for music in the mid-1940s when he was a high school student while practicing the trombone in the fourth-floor band room what is now Quincy Junior High School. After he graduated in 1947, Lubker went on to a distinguished career in psychology as a practitioner and educator while he continued to play music in various bands and orchestras. But he never forgot his hometown roots. A couple of years ago, Lubker and his wife, Bobbie Boyd Lubker, decided to give back to his alma mater. 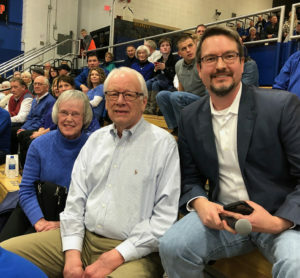 They made a significant donation to the Quincy Public Schools Foundation’s “Dream Big” campaign to recognize the music education he received while attending school in Quincy. The Lubkers specified that the donation be used to help revitalize the band room, which had fallen into disrepair over the years. A leaky roof had caused considerable damage to the room’s ceiling and wall, and then the asbestos floor tiles started to break up. Other parts of the room had also deteriorated with age, including the curtains covering the tall windows on the room’s east-facing side. The Lubkers’ donation triggered a rebirth of the band room. The Quincy School District initially used life-safety money to repair the roof, fix the ceiling, plaster the walls, apply paint, remove the asbestos floor tiles and install new flooring — all of which helped restore the room to a safe and solid environment for students. But the life-safety money could only be used for structural repairs — not for aesthetic enhancements. That’s where the Lubker donation came in. It’s being used to restore the room to its original grandeur and usefulness. For example, funds were spent replacing the dilapidated curtains on the east-facing windows with remote-controlled shades that block the morning sun’s glare. Other funds were used to install new instrument-storage cabinets, refurbish the wooden podium and buy new chairs and music stands. The school also will be updating the room’s sound system, and there are “additional upgrades to come,” according to assistant principal Rick Owsley. A dedication ceremony was held Thursday afternoon for the revitalized band room. 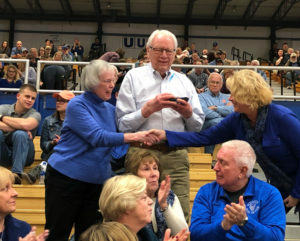 The Lubkers traveled from their home in Chapel Hill, N.C., to be part of the festivities and were feted as guests of honor. John Lubker said he was pleased to see all the improvements made to the band room over the past two years. 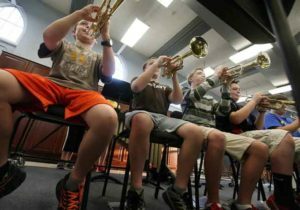 QJHS Band Director Debbie Johnson said the band room is vastly improved compared to just a few years ago when the ceiling and floor were literally crumbling. Owsley agreed the renovations wouldn’t have been possible without the Lubkers’ generosity. “With dwindling public funds available for these types of projects, the Lubkers’ donation was absolutely essential to making this happen,” he said. Owsley said quite a few QJHS music students took it upon themselves to send thank-you notes to the Lubkers for helping to restore the band room. “This is now a much more effective room for music instruction,” he said. The mission of the Quincy Public Schools Foundation is to acquire and distribute financial and other resources for the enrichment of academic programs and other projects aimed at fulfilling the mission of the Quincy Public School District. The purpose of the QPS Foundation is to raise and distribute funding to promote student development, to promote excellence through creative teaching, and to encourage school and community partnerships.